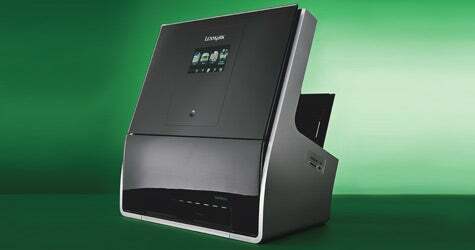 Lexmark boosts the style factor for all-in-one printers with its new Genesis. The all-in-one business printer/fax machine/scanner is becoming a work of art. The touch-activated Lexmark Genesis pushes the bounds of small-business imaging both in performance and good looks. The 15-inch-by-16-inch Genesis is about half the size of an average all-in-one printer. It holds pages vertically, so it can scan both sides of a document in a zippy three seconds. And the unit, which connects directly to the web, is controlled via a slick 4.3-inch touch-activated screen that's about the size of an iPhone. Performance is solid, with high quality and decent speed: 33 pages per minute in black and white, and 30 pages in color. But what really makes the Genesis unique is its design. Its attractive black form factor looks more like a high-end audio component than a printer, yet it doesn't compromise its image quality or functionality for light business use. The Genesis is far from perfect. The vertical page layout can be clumsy when lots of copies are required, and it is not a battle-tested concept for printers. (Who knows how hinges, hardware and electronics will hold up after years in the office?) And then there is the cost: $400, in a world where $60 buys a lot of printer. But for folks who want their printers to make a statement, the Genesis is an intriguing option.